Markets this week are down, in some cases substantially, due to a coming favorable weather pattern shift in Argentina. The forecasts last week hinted at this, but now it appears to be more real – all of the major forecasting models have trended wetter beginning Feb 1, and have pulled this pattern shift into the nearby timeframe, which is important. 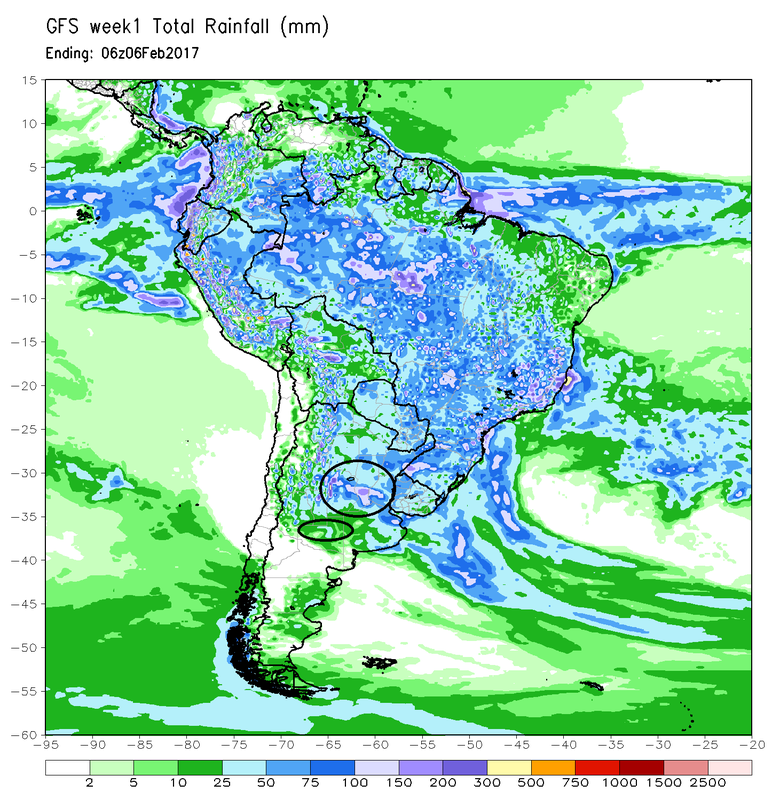 Anyway, following recent heat and dryness, a more normal pattern of rainfall looks to unfold in Central Argentina through the first week of Feb, and soil moisture levels will be near normal. It’s still premature to adjust South American yields from trend or near trend, and barring adverse heat and dryness in late Feb, or catastrophic weather at harvest, South American surpluses will be much higher than a year ago. The GFS model’s 7-day precip forecast is below; the driest areas of Argentina to date are highlighted. As for corn and beans, the markets are in the early stages of transferring global import demand from the Northern Hemisphere to the Southern Hemisphere. This transition never occurs immediately, and is often messy. The question of just when US corn and soybean exports slow down – and in the case of soybeans nearly shut off altogether – is difficult to answer until the latter part of February, but the most probable scenario is, indeed, a change in global trade flows. 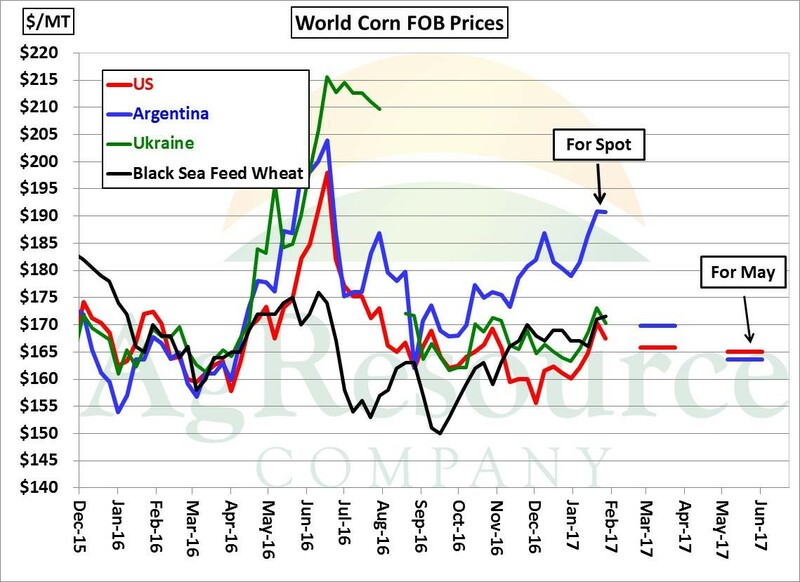 The graphic below displays spot Argentine corn basis. Tight nearby supplies have kept Argentina’s market non-competitive, and thus US corn exports have been rather solid – we expect the USDA to raise US corn exports 25-50 Mil Bu in the Feb or March WASDE reports – but change is afoot. Notice that forward Argentine corn offers (blue line) are some $30/Metric Ton ($.75/bu) below spot offers, and are slightly below Gulf corn quotes. 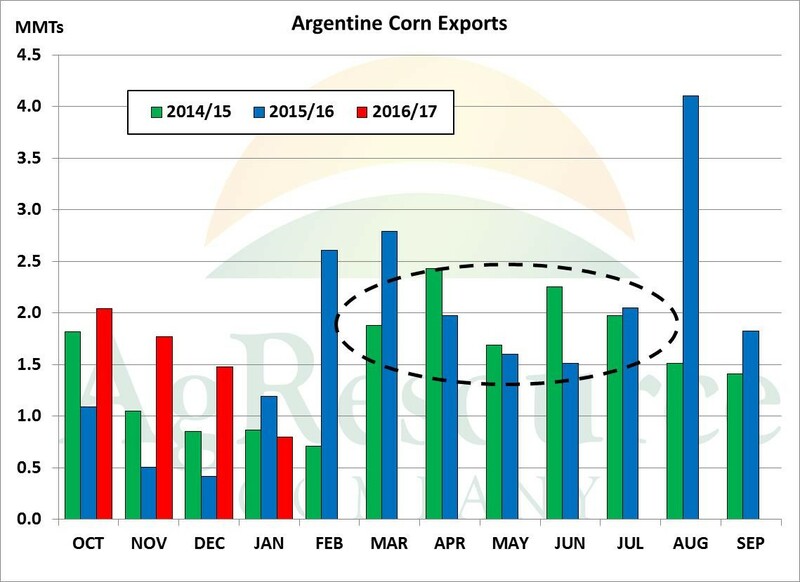 Seasonally, Argentine corn exports begin in earnest in April, and continue at 1.5-2.5 MMTs (60-100 Mil Bushels) through late summer. This week’s weather pattern change is important, as Argentine corn exports do look to ramp up beyond the next 6 weeks or so, and we mention this because US ag producers need to keep in mind that markets are very much global now. With the US’s share of world trade in decline, it’s important to keep tabs on global supply & demand, and South America, in particular, looks to be the driver of price beginning in spring. All indications point to an ongoing neutral price trend in corn.